How Many Is Too Many? 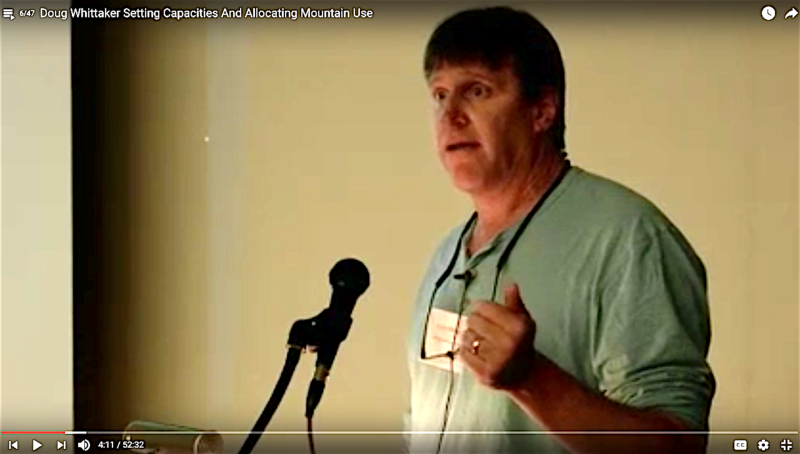 Setting Capacities And Allocating Mountain Use. Managers at many U.S. rivers and other backcountry areas have set visitor capacities to keep resource impacts at acceptable levels and maintain the quality of visitors’ experiences. Fewer mountain summits have such use limits, even though some alpine areas are infamous for crowding or resource or safety concerns related to use. Examining parallels between river and summit environments, the presentation will explore ways of assessing “how many climbers is too many?” as well as considerations when allocating use within guided and private sectors. Although the history of use and traditions at different mountains will continue to require case-by-case capacity decisions, applying common concepts and a transparent decision-making process is more likely to set capacities that achieve safety and conservation purposes while gaining support in the climbing community. Doug Whittaker, PhD., is an outdoor recreation planner and researcher with Confluence Research and Consulting, a two-person firm that works with federal, state, and local agencies as well as utilities and non-profits. Much of Doug’s work focuses on crowding, conflict, and capacity in recreation settings—usually on rivers—where he also studies how flows affect recreation in dam licensing, water rights, and navigability.